Opening two pages of Andy McConnell’s five page article in Antique Collecting magazine. In my last blogpost, I introduced you to Andy McConnell, a highly respected antique glass expert on the Antiques Roadshow, and author who just completed his twenty year project, the book The Decanter, Ancient to Modern. Andy had hunted me down in cyberspace after finding the mysterious “Face Decanter” at an auction house in London. On the left, the purple Face Decanter that Andy, right, found at a London auction house. I was especially intrigued by that purple Face Decanter that Andy discovered in the London auction house. It was one of two or three that were made at Blenko in 1962. Again, to quote Andy: “…one in blue with a nose so thin it broke, and the purple one with an ersatz stopper and improvised eyes made by Blenko after Husted left the company.” Actually, I believe it was made in the original session in which I was present. One nice surprise is that Andy has included the purple Face Decanter on the back cover of his decanter book. Front and back covers of Andy’s book. There’s the purple Face Decanter in the lower right corner on the back. Seeing it again, I really liked the design, and was inspired to recreate it—to bring it back from the dead like in the parable of Lazarus, a bible story I remember from when I was a kid in Sunday school. Here was my poor abandoned design, lost to memory and the cullet bin, mysteriously back to life in the faraway land of London, England, over a half century later. So I named my current face vase Lazarus. The new Lazarus Face Vase in three color combinations—opal, daffodil, and teal. The new Lazarus story began several months ago, on a drive in the Central Valley of California, looking for a source for cherry logs with which to make molds, I found a cherry farmer who had put up his land for sale and was removing the old cherry trees. He offered to give me as many of the freshly cut logs as I wanted, since he was just going to have them hauled off any way. Cherry wood is actually the best wood for glass molds because of its sap content. Old logs that have been setting around to dry are no good—they must be fresh. The cherry logs that I brought back from the orchard in Lodi, and the Lazarus mold that Don Augstein made from one of them. It was great to find logs this large from mature cherry trees. I trucked four big logs home and asked my cabinet maker/sculptor friend, Don Augstein, if he’d like to collaborate on making a mold for the new design based on the vintage face decanter. Don had the perfect skills and tools to make the mold. Once the mold was ready, we took it to two different glass studios before we finally got a great looking artist’s proof of the Lazarus Face Vase in opal (pictured above). Don Augstein beginning to carve a mold in his shop in Grass Valley. Like the original face decanter that we attempted at Blenko in 1962, the current Lazarus was challenging to blow even though I increased its width by a half inch or so and changed the proportions of the nose and mouth. Alex Abajian of Glow Glass Studio in Oakland is the very talented glass artist who is making the numbered editions of the Lazarus in five different color options. We are also working on a Lazarus Face Decanter with stopper. Alex Abajian of Glow Glass Studio heats the Lazarus vase just before applying the eyes and decorative wrap. 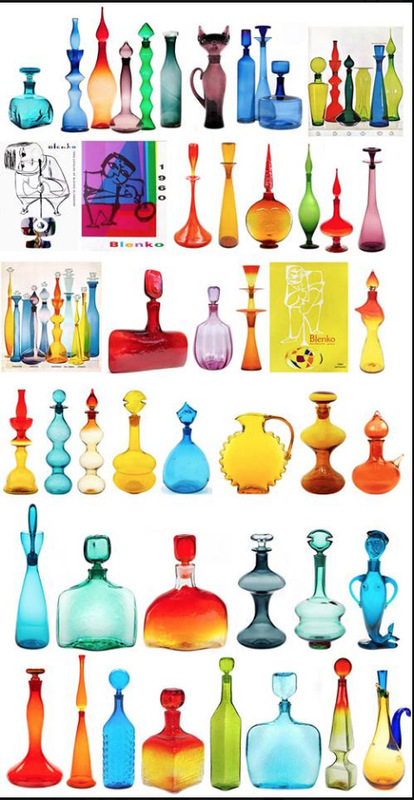 The forty plus Blenko decanters in McConnell’s book have become highly collectible by serious antique collectors as well as those just enjoying the search through antique malls and eBay.